Business processes of companies are different by every set of activities. These can be differentiated from each other by using modules. Admins can see the active [1.3.] modules and those that are moved to Trash [1.4.] on the Settings [1.1.] > Modules [1.2.] page. To add a new module, click on the [New module] button [1.5.] and choose a template, then click on the [Add] button [1.6.]. Statuses, Emails, Tasks and Follow-up sequences are added to the new module based on the selected template. They can be customized later. Only admins can perform module settings by going to the Settings [2.1.] > Modules [2.2.] page and clicking on the name of the selected Module [2.3.]. After performing the settings, click on the [Save] button [2.4.]. To rename a Module and its items, or change its position [3.3. ], go to the Settings [3.1.] > Modules [3.2.] 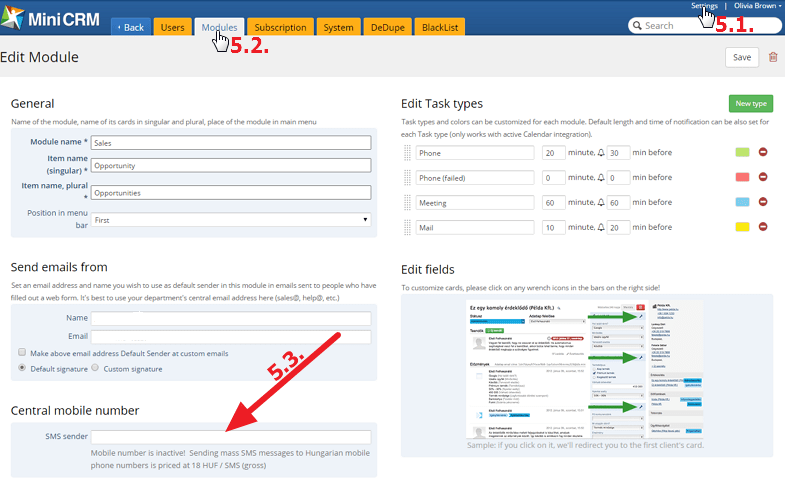 page as an admin, click on a module’s name and perform the settings on the Edit Module page. Go to the Settings [4.1.] > Modules [4.2.] page as an admin, click on a module’s name and on the Edit Module page set a name, email address and signature for the Central Sender [4.3.]. Default signature is a previously created template that is equal to the system’s language. The Central Sender’s signature consists of data set in the Name, Email address, Mobile number fields. Default arrangement cannot be changed. By selecting the Custom signature option, you can add more data to your signature. So you can create different signature templates in every module. To insert a - default or custom - signature into a message, use the Sender: Email signature variable. If you check the Make above email address Default Sender at custom emails option, you can set the central sender of the selected module as the sender of custom emails sent by users. It can be changed in the Sender field before sending the email. This function is useful if you want to send messages from the Sales or Helpdesk module by using the central email address. Go to the Settings [5.1.] > Modules [5.2.] page as an admin, click on a module’s name and set a mobile number that will be used as the central sender of SMS messages within the selected module [5.3.]. Different modules can contain different task types. To customize task types and colors, go to the Settings [6.1.] > Modules [6.2.] 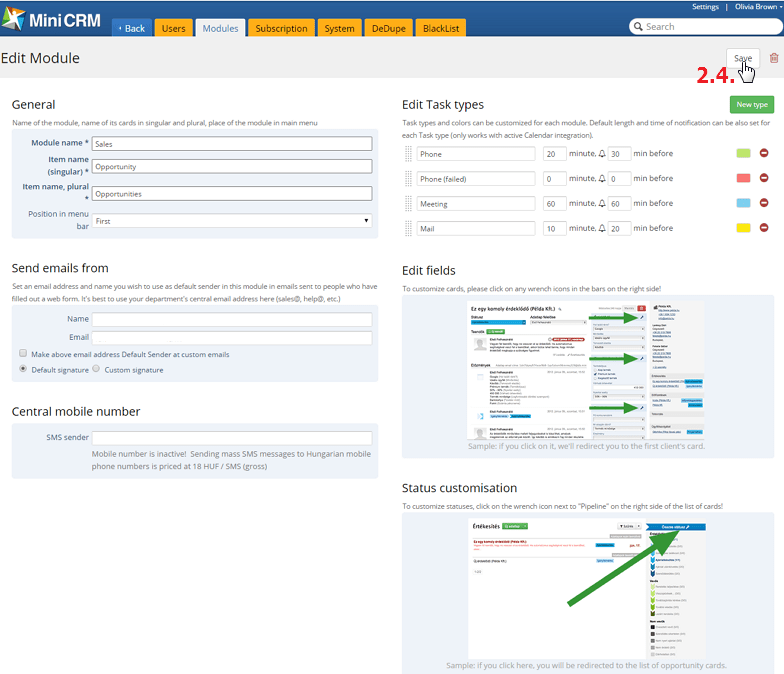 page as an admin and click on a module’s name. You can set a default duration and notification time for every type that can be seen on synchronized calendars. You can edit the types’ name, duration, notification time and their color. It is also possible to change their position (upwards-downwards) and to delete them by clicking on the red icon [6.3.]. To add new items, click on the [New type] button [6.4.]. Only admins can delete modules by going to the Edit Module page and clicking on the selected Module. If you click on the [Trash] icon [7.1. ], the selected module becomes inactive. You cannot see inactive modules in the main menu, on cards and on contact cards. Moreover, no cards can be added to that module. If you restore it, the module will be active again.